The FullContact integration provides additional data about your chat visitors right in the LiveChat widnow. No need for switching the apps. As a result, you will be able to provide personalized assitance and deliver efficient customer service. FullContact is an online contact management solution. This API suite allows your business to gather more information about customers and leads. Thanks to it, you are able to connect data keys associated with a person's email address, phone number, company domain or social profiles and get a complete customer profile. After gathering information, FullContact stores contacts securely. From here, it keeps these profiles up-to-date with monthly or daily updates. By monitoring public social media and photos, the FullContact’s activity log feature keeps feeding new information back into stored contact profiles. Gain additional info like for which organization your customers are working for and what they are responsible for in their job. All that it takes is your customers' email. We will take care of the rest. Don't get yourself busy with the installation process – with our step-by-step tutorial and the straight-forward settings panel, all you have to do is to copy and paste your API key. As simple as that. Easily access all of the publicly-available information of customers, such as their social media profiles - then use this data to provide more personalized support. Access valuable information on your visitors straight from the LiveChat agent app. 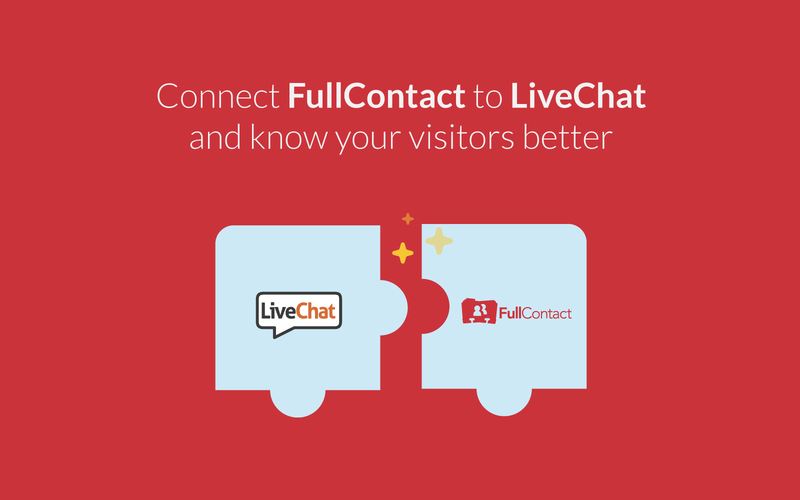 Start using LiveChat with FullContact now!